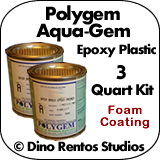 Polygem Aquagem Epoxy Plastic Foam Coating - 3 Gallon Kit - Dino Rentos Studios, INC. This is a water-based epoxy coating specially formulated for use as a hard cost for foam surfaces. Its unique water-based formulation allows for ease of application. You can add Thickener Agent to make the coating thicker to brush on and stay. It will self-level, leaving a smooth flexible plastic surface. Mix 2 parts of B with 1 part of A. Mix until streak-free and uniform in color. Apply with a brush or roller. In 5 hours, it will be firm and takes 24 hours to cure. Thickener should be added for a brush and stay consistency (sold separately). This firms up the foam coating so it will not run down verticle surfaces. Kit is a total of 3 Gallons.